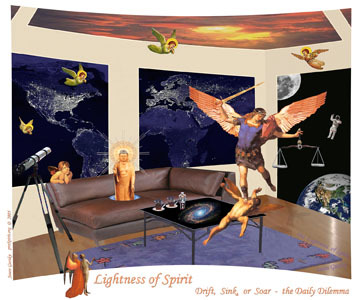 The Lightness of Spirit is my favorite in the Re-Creationist Art Gallery. It's also my answer to Existentialism. We are all adrift in life and without significant supports, until we take resposibility for our lives. because we are choosing our attitudes and actions. To Drift, Sink, or Soar is our Daily Dilemma. Choosing healthy attitudes and actions will not only help progress one's own Spirit, but the Spirit of others. By adding our Light to the Sum of Light, we become our own support as well as helping others. Adding your Light to the Sum of Light guarantees healthy positive growth for all. 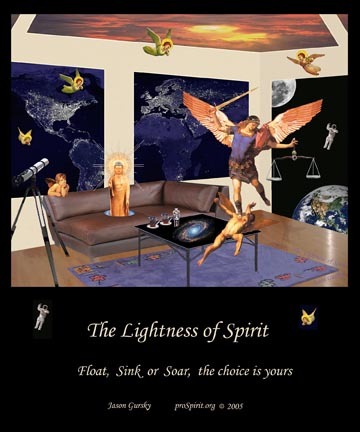 The Lightness of Spirit is available as prints from art.com in the following sizes and costs. Shipping and sales tax are extra. Wall Posters are printed at 300 dots per inch (dpi) and will be clearer and sharper than displayed on the Internet at 72 dpi. The print is the image only and does not include the color matting. The following matted prints are shown only as color sugestions. Art.com will print and ship to you just the Wall Poster, unless you order framing.